Internet search leader Google Inc. on Monday said 24.6 million shares will be sold for an estimated $108 to $135 each, depending on the unusual auction Google plans to employ as early as next month, according to a regulatory filing. The Mountain View, California-based company estimated its market value to be as high as $36 billion, rivaling corporate stalwarts such as McDonald's Corp. and Sony Corp.
That would mean that between $2.66 billion and $3.32 billion in stock would be sold in the initial public offering. However, the amount the company itself expects to raise is $1.66 billion, because some of the shares being offered are being sold by existing stockholders. It would be the eighth largest IPO in history, ranking higher than most that took place during the dot-com boom of the 1990s. Unlike those companies, however, Google has consistently been profitable and has posted steep revenue increases. Could Ebola be turned into a bio-weapon? Google, which is offering just 9 percent of its stock, would have a market capitalization between $29 billion and $36 billion, counting shares held by insiders. The average in the S&P 500 is $21.25 billion. Rival Yahoo Inc. has a market cap of nearly $38 billion. Once trading of the shares begins on the Nasdaq Stock Market, Google expects to have the ticker symbol "GOOG." Google shares will be distributed in an auction designed to give the general public a better chance to buy stock before shares begin trading. In the past, companies' IPO shares have been restricted to an elite group picked by investment bankers handling the deal. Analysts expressed some surprise that the search behemoth — given its "Do No Evil" mantra and its desire to democratize the IPO process — is not going to split its stock to bring the price range down to levels more appealing to average investors. "I think that's a little bit ridiculous," said Paul Barder, an analyst at Renaissance Capital in Greenwich, Connecticut. If individual investors have $100 they want to invest, "they're not even going to get a single share." Google executives appear to be following in the footsteps of star businessman Warren Buffett, who has called splits a Wall Street gimmick. Class A stock of his Berkshire Hathaway Inc. has never split and it now trades at about $88,000 per share. Google founders Larry Page and Sergey Brin, who created the company in a Stanford University dorm room in 1998, also stand to profit handsomely from the IPO along with its venture capital investors. In the filing, Google said Page and Brin will each sell 1 million of their shares, generating about $117 million for each based on the midpoint of the company's range, $121.50 per share. They will still own more than $4.5 billion worth of stock each, and their preferred shares will carry more voting power than the stock traded publicly. But John Doerr of Kleiner Perkins and Michael Moritz of Sequoia Capital stand to profit even more. Doerr will sell 2.1 million of his 21 million shares for an estimated $255 million; Moritz will shed 2.4 million of his 23.9 million shares for more than $290 million. The stock offering also will provide a big payoff for Yahoo and America Online, which each were early investors in Google. Yahoo is selling 549,000 shares; AOL will unload 867,000, according to the filing. At $121.50 per share, Yahoo would collect $67 million, while AOL would reap $105 million. Google's filing with the Securities and Exchange Commission gave an updated picture on the company's booming growth, fueled almost entirely by advertising linked to online searches. For the three months ended June 30, Google earned $79.1 million, or 30 cents per share, compared with $32.2 million, or 12 cents per share, in the same period last year. Sales more than doubled, to $700 million in the latest period from $311 million last year. In the first six months of 2004, the company earned $143 million, 54 cents per share, on revenue of $1.35 billion. In the comparable period last year, the company's profit was $58.0 million, 23 cents per share, on revenue of $560 million. Google also reported that it had 2,292 employees as of the end of the second quarter, up from 1,907 at the end of the first. Meanwhile, some Google users reported that the company's Internet site was generating error messages instead of search results Monday. David Krane, a Google spokesman, did not immediately return a phone call seeking comment. 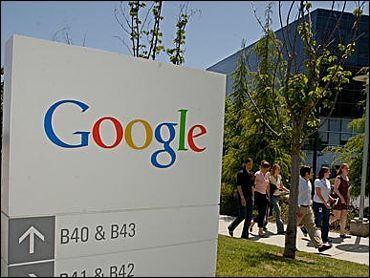 Monday's document was the fourth revision of Google's IPO filing, which was first released in late April.